We looked randomly out the window into our yard yesterday (Dec.28th) only to observe a hawk sitting on top of a pile of white feathers! We stood and watched until it flew away with the remainder of its prey. On further inspection the only things remaining on the ground were feathers and a leg. We weren’t quick enough with the camera, so really have no idea what kind of hawk it may have been. The location is Ridgewood Rd. (Woodglade & Sherbrooke). Perhaps 3 feeders are 2 too many? 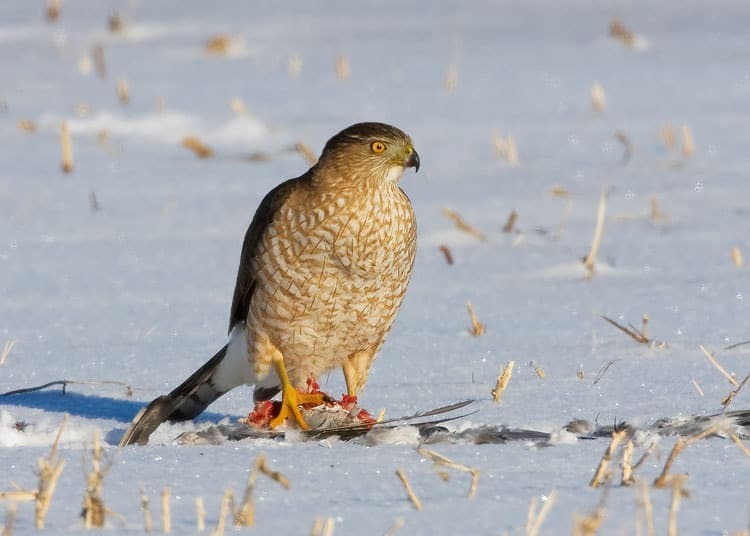 Note: The populations of birds that frequent backyard feeders are all quite healthy, so I wouldn’t stop feeding just because the odd individual falls prey to a hawk. D.M.